Winter apparently cannot let 2013 end without one last blast of snowy and brutally cold weather for Schoharie County, which according to WNYT will experience a myriad of conditions over the next 24 hours as a storm moves in from the coast - including rain, sleet and snow - that will be followed by a frigid blast of Artic cold air. 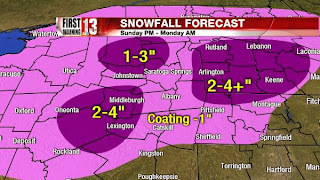 Tonight's storm is predicted to bring maybe two to four inches of snow to Schoharie County, with only a dusting expected in the surrounding areas. Hardly worth mentioning after mid-December's foot of snow that created a winter wonderland just a few days too early to enjoy during Christmas. However, what snow we do receive will be rendered insignificant weather wise by an Artic cold front that is forecast to bring single digit to sub-zero low temperatures across the area, stretching from tomorrow night until Saturday. High's aren't expected to be much better with thermometers not likely to reach twenty at all this week.